We’re on our way to Edinburgh … by way of Theatre Royal Margate! In the lands of the North, where the black rocks stand guard against the cold sea, in the dark night that is very long, the Men of the Northlands sit by their great log fires and they tell a tale … and the tale they tell is of Noggin the Nog, strong and fair and brave as the men of the Northlands are. So begins the tales of Noggin the Nog. Our tale is about a group of performers, musicians, directors, puppet makers, designers and a team of dedicated people who all want The Sagas of Noggin the Nog to go beyond the one successful tour of 2013. To this end we are starting again. After three or four days of putting together a project for Kickstarter (of which more later) and checking costumes, props, set and sending e mails by the score, Monday arrives! We have almost two weeks to re-write and re-rehearse the play. Why? Well, we are taking The Sagas of Noggin the Nog to Edinburgh and we have to shorten the show to fit in with the festival schedule; currently the play lasts seventy-five minutes and we have to cut it so that it fits into an hour slot. We also have to lose some of our equipment because there is nowhere to store it at the venue. We also want to rework the second half of the play which has a slightly different feel to the first half and we would like to make it more consistent. So, Monday … thanks to an association with the Theatre Royal Margate, we have a rehearsal space at The Winter Gardens … up lots of stairs, I might add … still it keeps us fit. And then on Friday 11th July 2014 we are previewing our new slimline version of the show at the Theatre Royal Margate (there is a link at the end of this post). 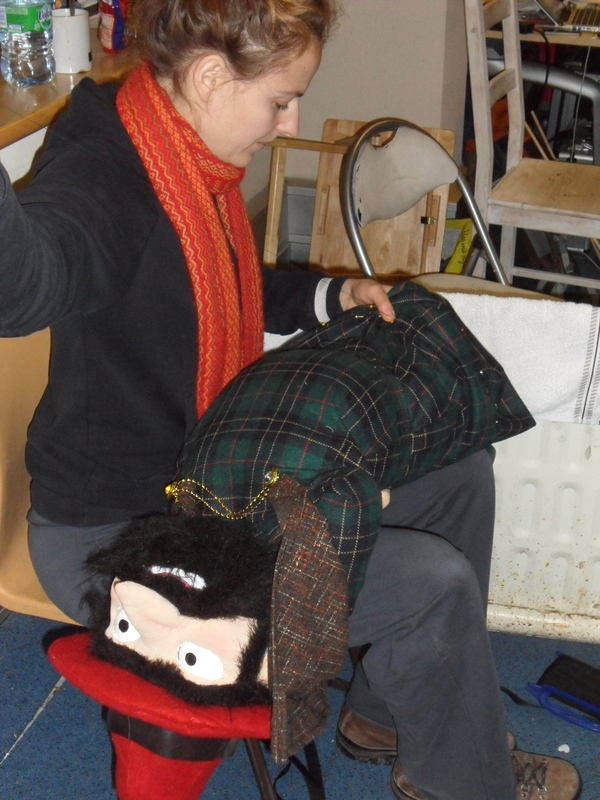 During the tour of “Noggin” last year we made an important discovery … this play is genuinely a piece of family theatre. Yes, it works for children, yes, it works for adults but it works particularly well for family audiences. Why is that important? I have noticed over many years of touring theatre that there are fewer and fewer family shows being produced. There are lots of “kids” or worse “kidz” shows and many shows for adults but few that attempt to entertain, intrigue and engage the whole family. In Britain we have the Pantomime but the majority of those have long since stopped trying to engage all of the audience. It is rare that as a family we sit in a large room filled with other families and share an event, an experience, and it is this shared experience that makes it special. We get home and talk about what we experienced collectively; something that happens less frequently in this “solo world”. We see parents sitting with their mobile phones or tablets whilst their children sit on their mobile phones or tablets and no matter how brilliant and engaging they are, they are not sharing an event. The Sagas of Noggin the Nog is an event, an experience to be shared. Last year at the Lighthouse, Poole whilst talking to the audience afterwards, we met four generations of one family who had watched the show together: there was something quite magical about that … four generations talking about a shared experience. So, we want to take the play to more venues, to be seen by more people. For this, we are taking the show to Edinburgh. The festival is the biggest showcase for performance in the world. If we are going to take The Sagas of Noggin the Nog to a wider audience, move it onto another level, we have to be there. There will be thousands of theatre professionals, venue bookers, producers and so on at the festival; we have to let them see our show, meet them, talk to them; we have to create an interest in the play in order for it to go further. As I sit here on a bright and sunny Sunday afternoon I am aware of all of the thousands of things we have to achieve in the next few weeks. Most imminently is the next week of rehearsal and the preview at Theatre Royal Margate; we are doing two performances, one in the afternoon for schools (which is free) and one in the evening for the general public. Follow the link for more information. We then have to prepare everything for the Edinburgh Festival. Not least of which is raising a little more money to make it viable. We have set up a Kickstarter project to this end … if you can help us by backing the show we would be most appreciative. Again, follow the link. This entry was posted in Uncategorized and tagged Edinburgh Festival, family, Kickstarter, Noggin the Nog, theatre, Theatre Royal Margate. ← Noggin Rides Again … Again!